No. 6 - The Baba shoe is a soft, stylish, sleek treat for your feet. Much more than a normal flat heel, the padding fits your feet providing support for even the longest walking days, and the best part? They'll look good the whole time. Oh, and if you want a little more flare with your shoes, you're in luck. The back tab of the Baba is designed in such a way as to allow you to fold it down, quickly transforming this from a form-fitting shoe to a sleek and stylish slide. Chinelas, which sells comfy kicks from a roving shoe truck, has found a permanent home along the pedway of Block Thirty Seven 108 N. State St.
Argentinean-American designer Christine Picerno is traveling Chicago this summer with her one-of-a-kind shoe truck that offers a modern take on a house shoes from around the world. Her shop, called Chinelas, is Argentinian for slipper and her designs follow suit with a comfortable slip-on alternative to sneakers. Choose from the loafer/mule style Babas or the indoor sandals known as Chanclas. 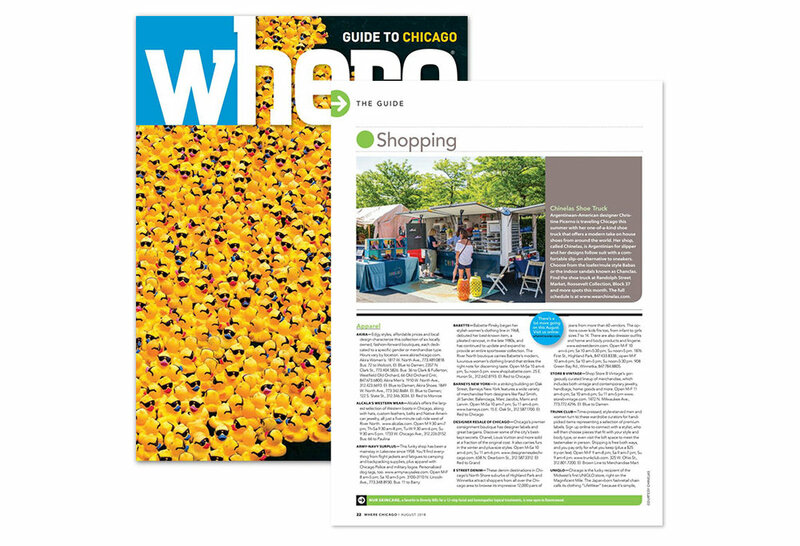 Find the shoe truck at Randolph Street Market, Roosevelt Collection, Block 37 and more spots this month. Adventurous souls slip on these comfy travel slides for a flight, or hit the streets for a day of sight-seeing. CHINELAS are inspired by house shoes from around the world and comfy enough for lounging but are fully-functional outdoor shoes—perfect for lazy peeps and adventurers alike. Best of all: they come in every color of the rainbow, with more than 50 shades to choose among. PICTURED: BABAS slides, $75 per pair. wearchinelas.com. What better time than summertime to invest it a pair of easy-to-slip-on (and slip off) shoes? For city strolls that turn into walks through Lincoln Park or North Avenue beach, check out styles from Chinelas (wearchinelas.com). Helmed by designer Christine Picerno, the Chicago-based brand is named after the Argentinian word for slippers, and was inspired by a muse close to Picerno’s heart. Styles—all available online—include a pair of plush, pink-velvet mules ($75) and yellow crisscross sandals ($42). Destined to become the new grab-and-go slip-on, Chicago-based Chinelas is a new show line inspired by international versions of the house slipper. Argentinian-American designer Christine Picerno launched Chinelas. "My grandmother, like world grandmothers, tended to wear the most comfortable and readily accessible house shoes both indoors and out, " Picerno remembers. "My family was embarrassed when she would run out of the house in her chinelas, but she always protested that they were the most comfortable shoes she owned! I thought to myself—what if I created a brand that feels like a slipper, but looks like a shoe?" Picerno recently hit the road with a new Chinelas shoe truck so customers can see the entire collection for women, men and children.